All apologise to U2 but I couldn’t resist the pun! 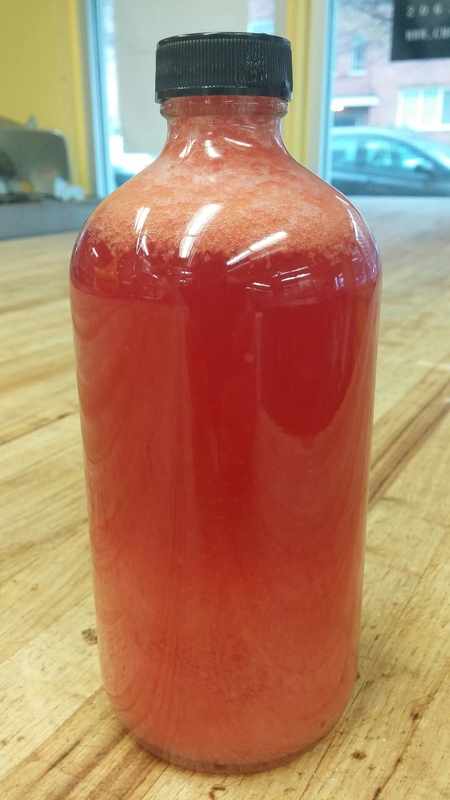 This was a really fun flavor for me to make because I LOVE blood oranges. But Washington state is not known for their citrus growing regions (because we don’t really have one). So I thought citrus fruits would forever be relegated to an accent flavor, like in our Raspberry Lime that comes out in the summer. Delicious accent flavors sure, but never the star. Then the amazing people at Letterpress Distilling decided to make a blood orange liqueur, which meant they had all these partially zested oranges laying around destined for compost. Clearly I had to save some of them. And I’m so glad I did! This shrub is deeply orange, with notes from the flesh and the thin layer of aromatic zest left on them. The oranges were rich and juicy and bittersweet the way a good blood orange should be. And look at this color! It’s begging to spike your gin and tonic, or to take your margaritas to another level. Personally I’ve been replacing the lemon juice and grenadine in a classic Scofflaw with a healthy measure of this shrub. You can now buy it online and start experimenting. Partnering with Letterpress has let us keep to our sustainability goals while opening up flavors that were outside our previous reach. I’m so excited to see what the next Distiller Partnership flavor is (hint, it’s likely to be lemon)! 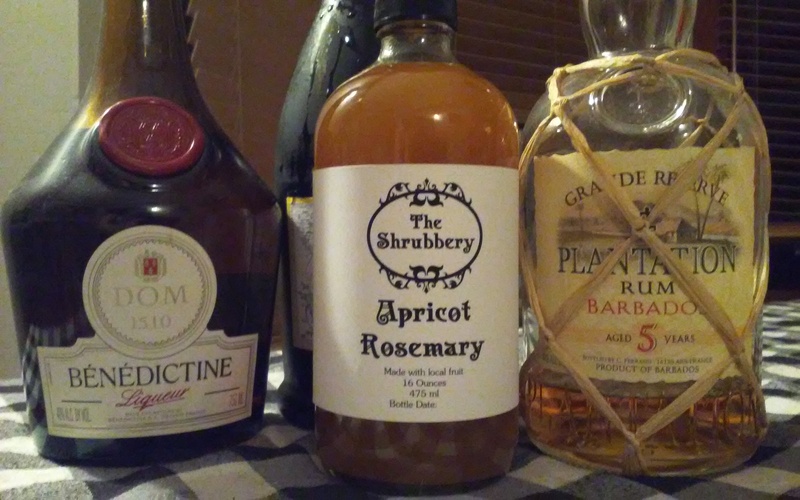 I get asked often about making a shrub cocktail with champagne. And with Valentine’s day this weekend I thought it woukd be a good idea to talk about how to combine these two delicious items. To start, it’s not advisable to just add a splash of shrub to a flute full of bubbly. The acidity of the shrub and the particles of fruit combine with the carbonation in a sort of 4th grade science experiment effect. In a shaker with ice, combine the gin, lemon juice and simple syrup. Shake 15 or so seconds and strain into a chilled flute. Top with bubbly and a lemon twist. Now, how do you modify this for use with shrubs? To start let’s look at the way the sweet/sour/strong ingredients relate to one another. There’s close to a 1 to one ratio of strong (the gin) to sweet/sour (the lemon juice and simple syrup). And the total of the three is around 2 ounces before shaking. So, if we’re replacing the lemon/simple blend with shrub we’ll need about 3/4 – 1 ounce. The classic calls for London Dry Gin, and I do love gin. Feel free to use it here as well. But say you don’t like gin. Then what can you use? Other options include: whiskey, tequila, brandy, rum, or vodka. The Blueberry Cinnamon shrub is lovely with rye, bourbon and rum. Or try the Spiced Plum shrub with brandy. 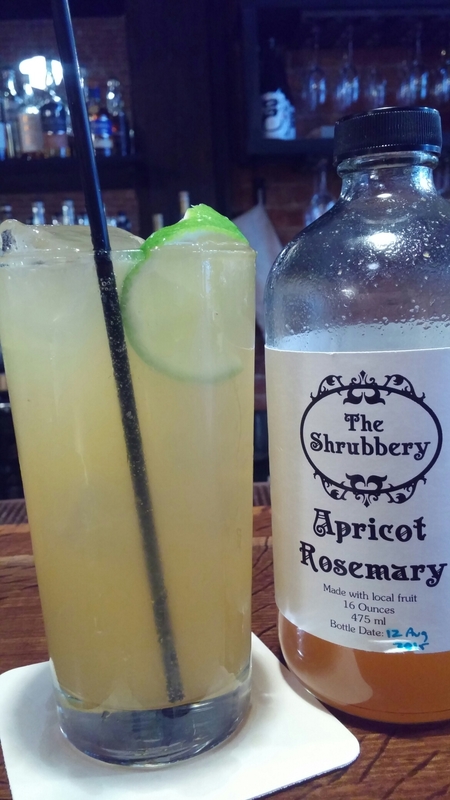 Maybe tequila and the Apricot Cardamom shrub suites you. In a shaker with ice combine the shrub, gin and bitters. Shake until well chilled, about 15 seconds. Strain into a chilled flute and top with the bubbly of your choice. Last night I had the opportunity to hang out with some amazing local bartenders, bar owners and distribution people at the Basil Hayden Art of Craft event, here in Seattle. I love these kinds of parties because I get to meet all kinds of folks involved in my chosen industry. And I get to show off my developing cocktail chops. While I was having fun sampling my shrubs just mixed with a bit of seltzer water, I also got to make a tasting cocktail that featured the Basil Hayden bourbon, which was the star of the evening. Manhattans are my go-to cocktail, and I am a big fan of the way they interact to having shrubs added to them. They’re also a fantastic option for the cocktails-at-home novice, because they require easy to source ingredients. You can also batch make a Manhattan, so they’re fantastic for entertaining (something to consider with the holidays coming up). I suspect this may be the signature cocktail for my Thanksgiving table this year. I love the way this came together. Sometimes blueberry cocktails can taste overly sweet, and bourbon is a pretty sweet spirit to start with. But, the high percentage of rye in the Basil Hayden puts this into an almost Bourbon/Rye hybrid territory with taste. 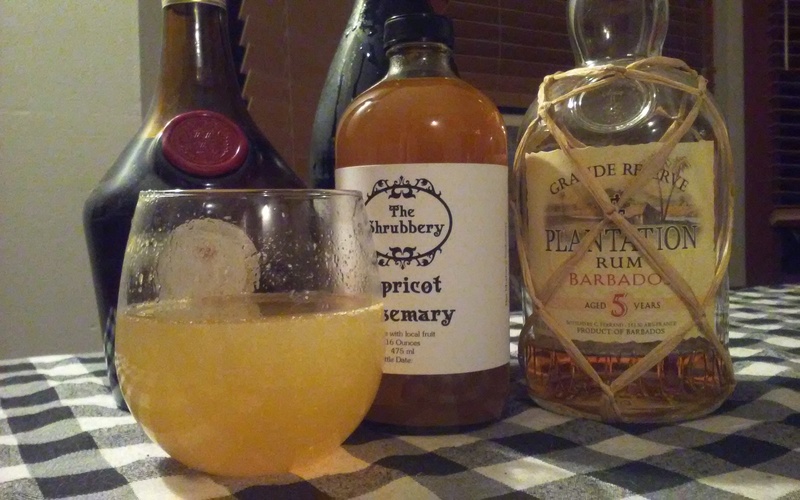 That, combined with the Broker’s Bitters and the cinnamon note in my shrub, really gave this cocktail a fall sensibility. It has lots of woodsy, earthy, spice notes with a pleasantly fruity finish. In a cocktail mixing glass, combine all ingredients. Fill the glass with ice, and stir well (about 30 seconds). Strain into a chilled coupe and garnish with an orange peel twist if using. One of my favorite things about what I do, is making new friends and experimenting with them. Today, I got a chance to stop into a really great place that has been on my list to try for ages. Damn the Weather is a precious hole in the wall, with an ever changing menu of locally sourced deliciousness. While we’re not partners yet, we did come up with an amazing cocktail. It continues my tiki vibe post Mixology Monday, with shrub of course, but has an early fall sensibility I can really get into. It’s a Rhum Agricol cocktail, which makes me really happy as it’s not a spirit I reach for often. Growth can be beautiful. And tasty. The Weather’s Fine starts sweet and fruity, with rum overtones. The middle is funky and herbaceous, with a spicy finish. Cardamom bitters act as an element to tie everything together, while the vinegar and lime keep your palette refreshed and ready for another sip. Blend Rhum, shrub, lime juice and bitters in a collins glass. Mix well. Topp with chilled ginger beer and cubed ice. Garnish with a lime wheel. Here in Seattle summer has been holding on, with 70 degree weather and sunny skies. But all I’ve been wanting are grey skies, and rain, and proper fall weather. Today the sky cooperated, just in time for my birthday! 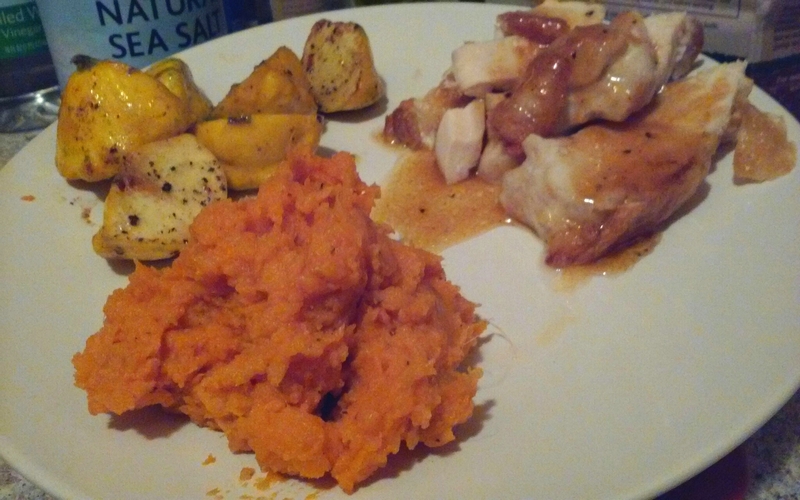 So I turned on the oven and roasted some sweet potatoes and chicken. Patty pan squash put in an appearance at the farmers market this weekend (they’re like zucchini but with a fun shape) so those came home with me. But what made this so tasty was the sauce I made for the chicken. Apricot Rosemary shrub, juices from the chicken, white wine and a little chicken stock. Sweet and chickeny and tangy and rich. This is a wonderful way to use shrubs in new ways. It’s especially fun because you can mix up the protein and the shrub to make tasty combinations. 1 chicken skin on but no bones. 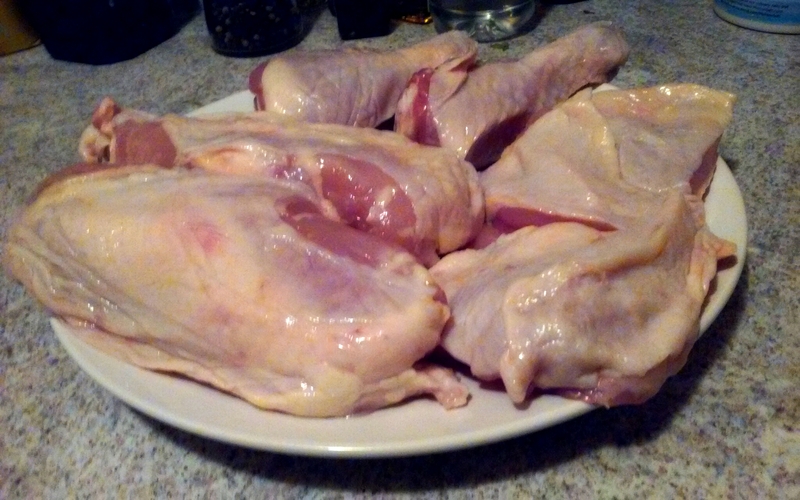 You can have your butcher take a whole chicken and cut it into parts (breast, thigh, legs) and take out the bones from the thigh and breast. Save the bones and the wings to make stock. Salt both sides of the chicken. In an oven safe pan, heat a tablespoon or two of oil on medium heat until it’s shimmering and starting to smoke. 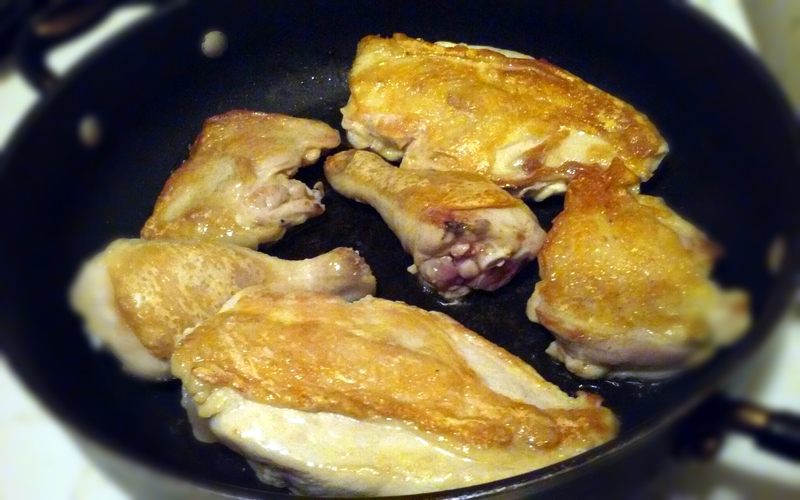 Put the chicken in the pan skin side down and cook it until golden. About 5 minutes. Flip the chicken over and bake until the breasts are done (internal temp of 160). Take the chicken out of the pan and set it aside to rest. This lets the juices redistribute in the meat, and is important. Put the pan on medium heat and add the shrub, stock, and wine to the pan. Scrape up any brown bits, because they’re full of flavor. 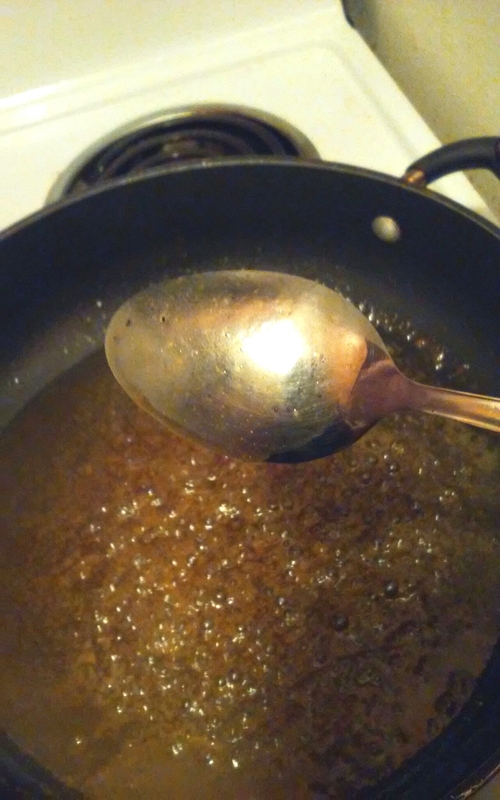 Let that simmer and reduce down until it coats the back of the spoon. Taste for salt and add a few grinds of black pepper. Slice the chicken breast and serve with a generous amount of sauce. Today was the kind of early fall day I love! The morning was chilly and misty but not really cold. That burned off for a crystal clear afternoon of brilliant blue sky. Just warm enough to shed the morning’s sweater, but cool enough to be really comfortable in tall socks and boots. I’ve been sad about the end of berry season. Perfect sun-ripened berries are amongst my favorite foods, and this season was both fleeting and spectacular. But the markets have turned to pears and apples, which I haven’t been quite ready for. Until today. 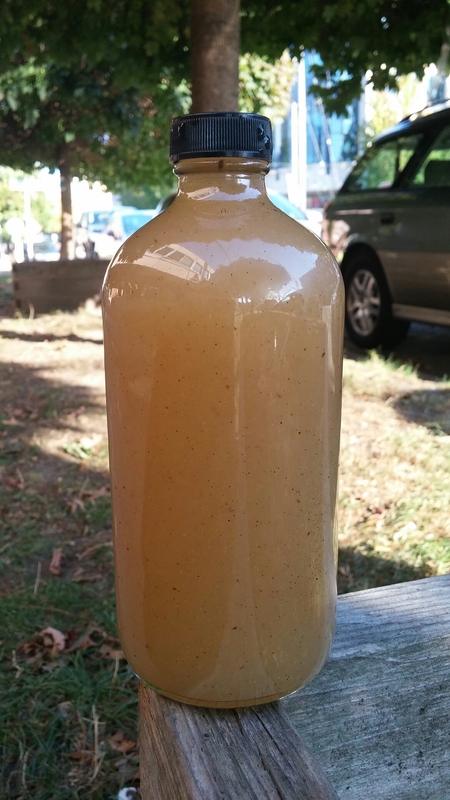 Today, fall was calling so I pulled out some pears and brought back our Vanilla Pear shrub. This is like a vanilla poached pear, but better. All those black speckles are vanilla beans. I even include the pods. This cozies up with lush pears to make a shrub that’s sweet and perfumed, but not cloying. Holiday seasons is coming up fast, and we’re really excited for all the plans and flavors! If you’re excited to see what we’re up to, consider a donation! 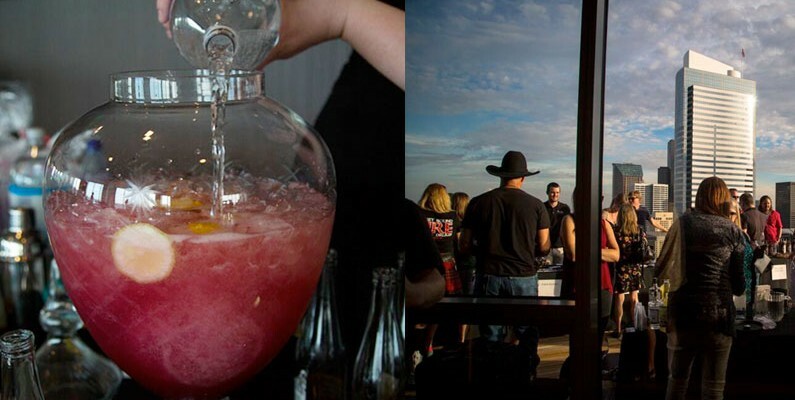 I can’t believe it took me this long to tell you about the amazing time I had at the Sip Northwest anniversary party, Sips of Summer. We were on the 40th floor of Premier on Pine, with an amazing view of the city, the sound and Lake Union. Gorgeous! As you can tell from this shot, the weather was perfect for sipping wine, beer, spirits and shrubs on the terrace. 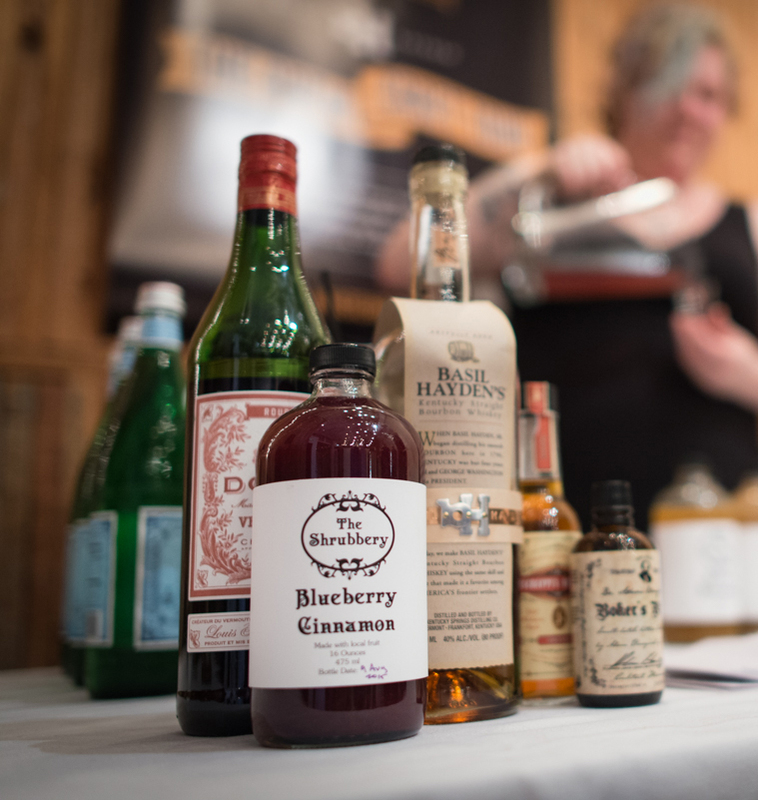 I had the wonderful opportunity to partner with Dry Soda to make some really tasty mocktails (in my vintage glass dispenser, naturally), and meet some more of the people who make up the Pacific Northwest community. It’s events like this that keep me focused on what I do. Seeing all the talent we have here, and getting to be a part of that, really encourages me to keep reaching. It doesn’t hurt that these parties are wicked fun to do, and I love introducing people to my product and the idea of craft mocktails.